Yes! Fitness Music : Yes!GO All Access Mobile Music with 30 day trial : Discover new music. Teach better classes. Workout Music for Fitness Instructors. 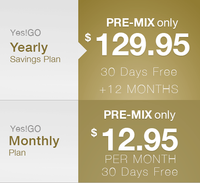 Yearly Saving Plan (30 days FREE then $149.95 for the year) $0.00 /mo. Quarterly Plan (30 days FREE then $39.95 quarterly) $0.00 /mo. 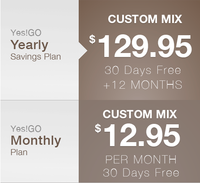 Monthly Plan (30 days FREE then $14.95 per month) $0.00 /mo. Your 30-Day FREE Trial Starts Here! The ALL ACCESS SUBSCRIPTION is the Best Value Subscription Plan. Choose our ALL ACCESS SUBSCRIPTION and gain unlimited access to more than 600 professionally-mixed fitness albums AND the ability to make unlimited custom mixes using myMIX right on your device. When you pay up front by choosing the YEARLY SAVINGS PLAN you get almost 2 months FREE plus a complimentary 1 year membership to Star Select – our new premier frequent buyer subscription that gives you 20% off all other products purchased from Yes! + FREE First Class Shipping on every order (up to $3.95/order). Access to ALL Yes! Fitness Music professionally mixed albums (includes all brands that we carry like Energy4Fitness, Megatraxx, etc). Unlimited In-App Custom Mixing. Make as many *custom mixes as you like right in your devise. No need to go to a computer or clunky website. Custom mixes seamlessly appear on your device within minutes. Industry’s best Pitch control technology (IOS and Android) and Interval Timers ( IOS devices Only). Easily find and use all of your past download purchases. Pause and resume one time during your subscription term if you need to take a break from teaching. Your renewal date simply gets pushed out into the future. Your subscription will automatically renew on the same day of each month or year depending on the program you subscribed to unless you upgrade, downgrade, change or cancel the plan. Music accessed under the subscription can only be accessed as long as you have a current active subscription. You do NOT need an internet connection to play music in your class. The FREE Yes!GO App is available for *iOS and Android. You must have the App in order to use your Yes!GO Subscription on your preferred device. Occasional connection to the internet is needed to access and download new music and in order to maintain your account status, you must connect to the internet prior to the end of your subscription term or the music will vanish from the device. You do NOT need an internet connection to play music in your class. The IOS APP Requires iOS 7.0 or later. Compatible with iPhone 4, 4S, 5, 5S, 5C, 6, 6+, 6S, 7, 7+ iPad – 2nd Generation or Higher, and iPod Touch – 5th Generation with lightning connector. The Android APP Requires OS 4.4 (Kit Kat) or later. You can login with 2 devices. Logging in to a 3rd device will disconnect your other devices. BONUS! ALL ACCESS Yearly Subscribers get a FREE membership ($49.95 value) to Star Select where you can make purchases of CDs and permanent downloads, T-shirts, windscreens, videos and more all at 20% discount plus you get FREE First Class Shipping (up to $3.95/order) on every order shipped. Choose our PRE-MIX SUBSCRIPTION and gain unlimited access more than 600 professionally-mixed fitness albums. The CUSTOM MIX SUBSCRIPTION is the Subscription Plan for the Professional that wants to control every element of their music. Choose our CUSTOM MIX SUBSCRIPTION and gain unlimited access to almost 6000 pop and original dance tracks when you create unlimited custom mixes using myMIX right in the app. No need to go to a desktop computer again. Unlimited use of myMix. Make as many 15-song custom mixes as you like right in your device. Custom mixes seamlessly appear on your device within minutes. Industry’s best Pitch control technology (IOS and Android) and Interval Timers (IOS devices Only).